ORLANDO, FL. 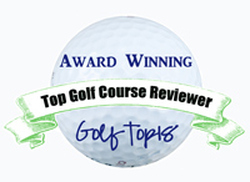 – The PGA of America has been holding its Merchandise Show for 62 years. In recent years it’s been generally overwhelming, frequently chaotic and always informative. It’s also, for many, a hint that spring – and the heart of the golf season –isn’t all that far away. 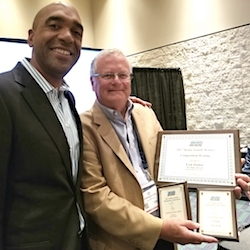 This year’s PGA Merchandise Show at the Orange County Convention Center drew the usual 40,000 attendees and had over 1,000 exhibitors. According to PGA estimates, if you walked through every mile of the show and checked out all the offerings relative to instruction, fashion, equipment and technology you would have covered about 10 miles. All the major manufacturers, of course, were on hand to introduce their new product lines. So were plenty of others who hoped that their products would captivate the golf industry in the months ahead. Some will, some won’t. Dave Weretka, GolfChicago publisher, is a big believer in the GolfBoard. This is my opportunity to reveal the products I found the most interesting – not necessarily the best. The bottom line is, these products underscore once again how inventive and innovative the people in the golf industry really are. My favorite from this 2015 show was also among the best. 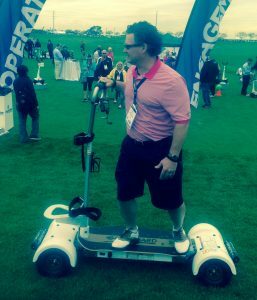 GolfBoard was selected Best New Product of the 2014 PGA Merchandise Show, but it’s still fairly new as far as even hard-core golfers are concerned. GolfBoard brings the concept of surfing to golf. You ride an electric board and it feels similar to snowboarding, surfing or skateboarding. The company calls it GolfBoarding and insists it isn’t difficult to learn. The GolfBoard carries one golfer, who is standing, and his bag. In short, you “surf the earth’’ when you take it on the course. The device speeds up play and makes the player more active than he would be sitting in the traditional cart. 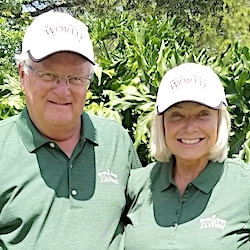 Dave Weretka, long-time publisher of GolfChicago magazine is GolfBoard’s representative in the Chicago area. Damaged club? Nope, it’s DST’s Ahead of the Curve pitching wedge. In addition to the bent shaft, the club has a white line on the clubhead and a wide, flat sole angle that encourages the proper swing for chip shots. It forces you to be in the optimal impact position. DST also offers an 8-iron that is legal for competitive play. Ray Rapcavage, a New Jersey resident who considers himself “a good amateur player,’’ brought along the Golf Swing Shirt – a striking orange pullover endorsed by three-time major champion Padraig Harrington and teaching guru Jimmy Ballard. 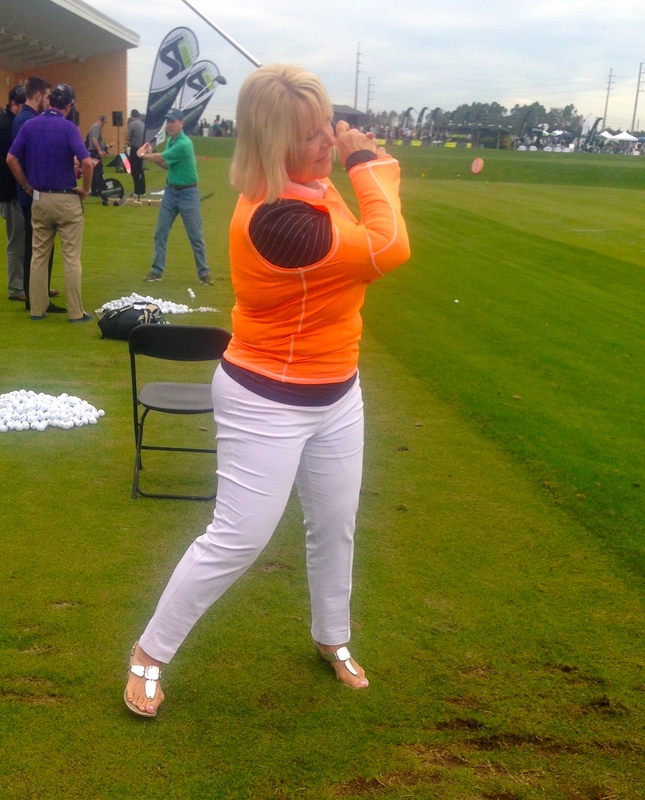 You put the Swing Shirt on over your own shirt, insert one arm at a time into the center sleeve and then head for the range. You may look and feel funny, but those who used the Swing Shirt on the huge circular practice range at Orange County National Golf Center felt they were striking the ball with body turn rather than the flipping of the hands, and the hands were always slightly ahead of the ball at impact. That resulted in a more reliable motion through the ball. At least one LPGA Tour player was intrigued enough by the product to take one home. The Swing Shirt keeps you from making a bad swing. PUTTING also traditionally inspires new products. Ed Klein, of Aberdeen, Wash., didn’t come with a new putter. He came with a new grip that could catch on as the USGA’s ban on anchored putting closes in for 2016. Klein’s product is the Arm-Lock Converter Putter Grip. You simply have a new (bigger) grip installed on your present putter. It comes in two models – round and flat – and fits any putter. Klein says either model will make you an arm-lock putter and eliminate the issues presented by anchored putting. The grip doesn’t require modifications to the loft of the putter but must be fitted properly. Of course there are plenty of new putters on the market as well, the most unusual looking being produced by Cure – a company formed in 2013 by retired architect Steve Davis and Florida teaching pro Jeff Ryan. Here’s what the OnCore ball looks like from the inside. The company, based in Buffalo, N.Y., claims it’s “the first major upgrade in golf ball design in decades.’’ The ball came out in 2009 but wasn’t approved by the U.S. Golf Assn. until last May. “There was a little hesitation because of the technology involved,’’ said co-founder Curt Rogers. The creators claim it has perimeter weighting that leads to an increase in vertical spin and reduces a slice up to 30 percent.